View TV, watch DVD recordings or VHS tapes. With this setup you can record to DVD or VHS tape and also playback VHS tape or DVD. 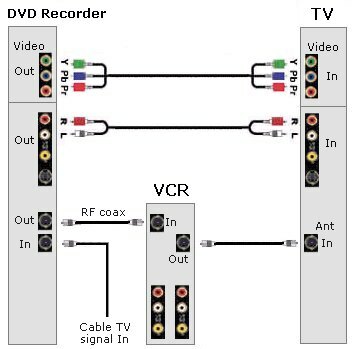 To just watch TV, the DVD recorder will "pass-thru" the cable TV signal to the VCR which will also "pass-thru" the signal to the TV. RF cable (cable TV input) which supplies the input signal to the DVD recorder. RF connection which supplies the signal to the VCR. RF connection which supplies the channels to the TV. Component video cables supplying DVD output to the TV. Audio cables supplying DVD sound output to the TV.